Turning detective when it breaks, firstly to find out what broke, by combing through search engines and forums, then working through a half-dozen half-assed suggestions that half-worked for other people who had the same problem. It's still embedding the Unix/Linux belief that the terminal session and command line is the best solution to any problem. Unity, which is a graphical user interface, keeps making me type things to find programs. And you still can't place the Launcher anywhere but the left hand side. Trying to get new and/or older hardware to work in whatever version I'm using, via a combination of firmware and settings (I know it's not the 'driver hell' we used to have in Windows Vista and now Windows 8, but comparative therapy doesn't help). Random kernel updates cause my Broadcom wireless adapter to stop working (along with half the rest of the Broadcom users, but not necessarily the same half). See hate items 1 and 4. Audacity sound editor randomly freezes while I'm editing (requiring a end process in a terminal or System Monitor). It's done this for as long as I remember in every Ubuntu version. Just as well Audactiy has the best recovery routines of any program I know. Canonical turning Ubuntu into iOS for an iPad with an appstore and Amazon crap in the search results (yes I know how to turn it off, I had to look it up). The disappearance of half the controls under System Settings since 11.04. No less than three Nvidia drivers for current graphics cards in 12.10. Confusion abounds especially when you pick the wrong driver and your desktop is unusable. Ultimate geek nagging such as in the forums: "Are you filing bug reports? Minor and major bugs should be fixed in the point releases. If they aren't make sure your bug reports are kept up to date." Robin, it's nice to see other people who love Linux and Ubuntu make these statements. 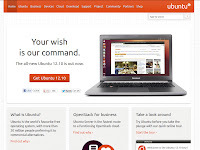 I initially embraced Ubuntu because it solved problems with proprietary drivers, ran on low end systems, and maintained a reasonable desktop (even if it was brownish - it could always easily be changed). Because it was such a good fit we standardised on it for all our refurbished desktops (non-profit computer reuse). Now it feels like Canonical has abandoned that market. Sure there's Lubuntu and Xubuntu, but they just weren't as good as straight Gnome 2 (and Kubuntu doesn't work well on systems like the Dell Optiplex GX60 - which we get a lot of). I've been looking at Linux Mint Mate as a replacement, but am discovering some issues/bugs with it as well. I like a lot of things about Ubuntu, but it's become less flexible and more buggy on the hardware we're trying to run it on (not just GX60's). I hate the lies and the childish, inhumane behavior of many Ubuntuforums managers. Robin, your sentiments are in alignment with my own experience. I stick with an Ubuntu LTS (12.04) and resist the temptation to update every six months. This seems to keep my periodic Ubuntu breakage to a minimum. Issues still pop up, but there are fewer of them, and I typically don't seem get hit with 5-10 breaks at once like the upgrades seem to have. I appreciate your honesty. I think Ubuntu is still a good choice under certain conditions, and yet IMHO there is no way Ubuntu is ready for prime time as a desktop consumer OS. There is no way Ubuntu is ready for the intense scrutiny of the phone/tablet consumer market unless they can get rid the significant buggyness factor and sporadic breaks. As you said in 2007, some rather obvious stuff remains unfixed. I can't count the number of times I've had to use the command line or some arcane app to edit a setting or tweak a this-or-that to get things working again. The general public simply won't put up with that crap for one minute, I am just stubborn, and I like Linux so I keep doing it. The general public has no such bias.